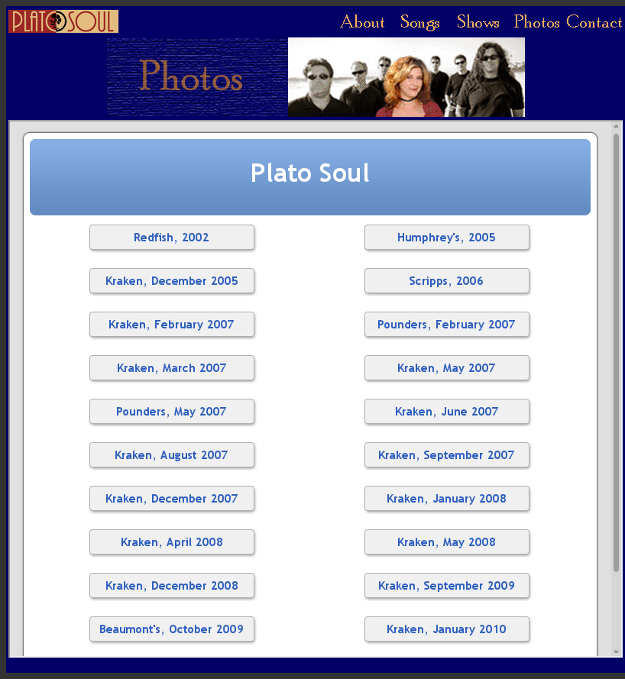 Plato Soul was an early website. The landing page has a spinning CD that ends up with the picture of the band. There are some important features: links to demo songs, a page of photos of fans at shows, contact information. This website was developed before social media was prevelant, so there are no links to Facebook/Instagram/Twitter. The website was developed using an HTML editor. I am a software engineer, musician, and athletic coach who loves to stimulate my brain with both logic and creativity. I can spend all day writing assembly code or playing jazz in a smokey bar. I like making things that work. And that look pretty. Let's talk design. Flow. Aesthetics. User interface. Tri-tone substitutions. Yardbird's influence on Coltrane. The best bunt defense with runners at 1 and 2. How to practice non-attachment. How to train for an Ironman triathlon. It is all on the table. I want to work for you. I want to help you realize your vision. Manifest your dream. Create the embodiment of your brilliance, either through driver level software development, a web-site, promotional material, or branding. Let's make something spectacular.